The sandwich shop on campus sells this amazing confection known as Cinnabon Pretzels. I first had one on my 19th birthday, freshman year of college. Nearly three and a half years later, the Cinnabon Pretzel is still my favorite thing to get at the sandwich shop – the perfect sweet treat for when you just… really need something sweet (that isn’t candy). After a quick conversation in Spanish and broken English with someone else behind the counter, she confirmed that they won’t be getting any more Cinnabon Pretzels, and are trying to look for something equivalent. 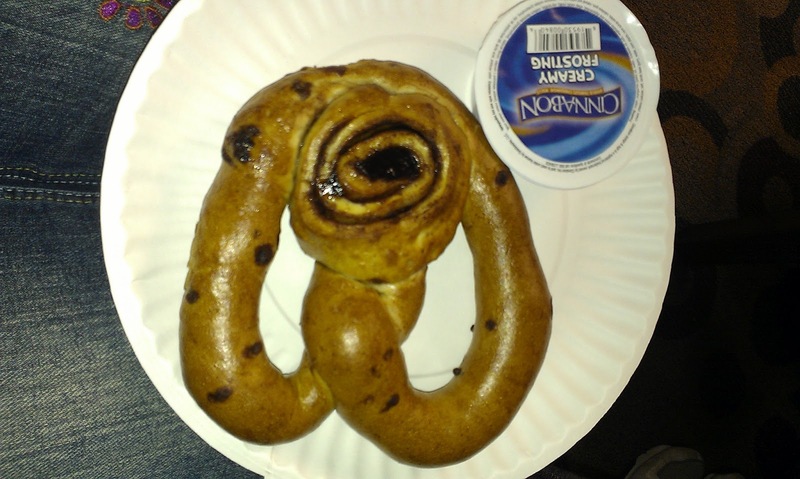 So, on Friday, February 22nd… I ordered my last Cinnabon Pretzel. Yeah, I had to commemorate it with a photograph. As much as I’m sad, I knew the day would come – I’m graduating in just a couple months. Instead of just consuming, my boyfriend and I picked it apart carefully, examining the cinnamon chips, the texture of the dough… hoping to unlock the secret behind the amazing confection. Soon we’ll start baking. Right now, I have pretzel recipes and Cinnabon cinnamon roll recipes at my disposal. The frosting is just a cream cheese frosting, so that’s easy. The rest is going to be more difficult. I’ll keep all of you posted. In the meantime, the sandwich shop has a delicious cream cheese filled pretzel I just discovered last week. And, of course, Nachos. Last weekend, I found myself at a Korean market. You ever just like… wake up… and suddenly… bam! Korean market! It wasn’t anything like that. Anyways, Korean barbeque is one of my favorite foods. My dad has a fantastic recipe for it. But it also seems like a hassle to make, and I didn’t get around to looking up the recipe, so I wasn’t about to make any right then. However, when I got to the market, I discovered something amazing. Right next to the kimchee (and they had more kimchee than Michael’s has yarn) was a deli counter with pre-marinated meats. Just pick your meat, buy it, take it home and grill it! So easy! Too easy, in my opinion. Also, a little expensive. Before long, I’d found the pre-made marinade that comes in a bottle, enough to marinade 5-6 pounds of meat. “Lets do this” I said. And we did. When I picked up the meat, a little old Korean lady next to me started talking. “You need to marinade that” she said. She pointed at the bones, I think she was referring to a method of getting out the bone marrow. I’m not sure. So I rinsed the meat off (there was a lot of grit around the bones so I’m glad I did this), laid it out in a container, and dumped the bottle of marinade over it. Enough marinade for 5-6 pounds of meat barely covered my two pounds, for some reason. Perhaps I was supposed to water it down. I did water it down a bit, but only so it would cover the top of the meat. I don’t have a grill, so I decided to broil the meat. Since the last time my dad made Korean barbeque with the broiler ended in my mom wondering aloud why he doesn’t cover the pan in foil to make for easy cleanup, I put foil on the pan. It’s surprisingly difficult to fit two pounds of short ribs on a broiler pan, but I did it. It was awesome. Also, I know this picture is sideways. Blogger doesn’t have a rotate picture option. Darn Blogger. The obvious next step: Putting the meat in the oven. Notice how hot the heating elements are. When broiling, the top heating elements in the oven (or the bottom in some gas stoves, apparently) get as hot as they can, and you put the meat as close as you can to the heat. Then you leave the door open to keep the oven from cooking the food like an oven. We flipped the meat every 2-3 minutes to ensure even cooking. I think it took around 15 minutes to be fully cooked. Here’s the final, fully cooked meat. All the while I was navigating around a pot of boiling water, because boiling water is the best way to humidify a cold, dry apartment when you lack a humidifier. Seriously, though? Staring at that meat is making me hungry. There were no leftovers. We ate our meat with kimchee and rice. My boyfriend (this was our Valentine’s date, after all) also had gochujung, a Korean red pepper paste that he loves. I tend to pass on that, since it’s very spicy. In my family, we also use lettuce: a leaf of lettuce is a perfect wrap for some rice, some kimchee, and a piece of meat. We don’t have lettuce on hand, however, so that was out. I’d say other things about how to properly eat Korean barbeque, but seeing as I’m not Korean and haven’t learned from anyone who is Korean, I should probably allow the experts to be the ones speaking on that topic. What I will say is that this was delicious and surprisingly easy. Also that foil is really hard to peel off a broiler pan (the foil we used, anyways), and that, as it turns out, my dad’s recipe for marinade is simple enough that we already had the ingredients for it. I didn’t want to make my own because I didn’t think I could find the ingredients at not an Asian market (possibly true for mirin), but I didn’t consider that I’d already have all of them except one – a pear. Oh no, where could I ever buy a pear? So I guess we’ll be doing this again sometime soon, and with a homemade marinade. If it’s almost as easy to make as opening a bottle, and tastes better… the bottled marinade was surprisingly good, but it wasn’t quite as good as homemade. Mmm. I’m hungry already.